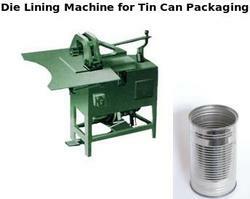 Offering you a complete choice of products which include die lining machine for tin can packaging. Die Lining Machine for Tin Can Packaging is useful to make lining of rubber in the flanges. These manually operated machines can handle square tins. Our machines are cost effective. Looking for Die Lining Machine for Tin Can Packaging ?